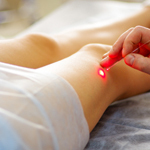 Millions of women are bothered by spider veins - we specialize in treating those small yet unsightly clusters of red, blue or purple veins that most commonly appear on the thighs. We’ve got your covered with state of the art treatment techniques, and our diagnostic ultrasound complimentary consultation will answer any questions or concerns you might have. Including diet, exercise and lifestyle considerations is more affordable than you think, as our treatments are often covered by your health insurance. For some individuals, the use of compression stockings and incorporation of simple lifestyle choices can improve the symptoms that varicose vein can cause. Weston Veins Clinic offers a comprehensive array of services for the diagnosis and treatment of problematic veins. Steven Weston, MD is actively involved in all vein procedures and is a board-certified surgeon. After an initial complimentary consultation, a diagnostic ultrasound examination is often the next step in determining which of our comprehensive treatment options would be most effective. Patients report little, if any pain or downtime with any of these procedures. Our payment plans are set up to be affordable and convenient! Weston Veins Clinic accepts a variety of credit cards, debit cards, & cash. (checks are not accepted). Care credit can be used for any purchase over $300! Our goal is to remain extremely flexible and we will work with you in any way possible to get the results you want and need. Weston Veins Clinic offers a wide variety of surgical procedures. Weston Veins Clinic is unique in that we educate our patients to help prevent future conditions and alleviate present symptoms. Sometimes making simple lifestyle choices can improve the symptoms that for instance varicose vein can cause. We are always ready to support and assist you, both before and after treatment. Want to learn more? Read on about our available treatments and financing options. Copyright © 2013 Weston Veins Clinic.